1 of 1 Cut avocados into large chunks and place in a medium bowl. Add lime juice, salt and pepper and mash to desired consistency. Stir in tomato, cilantro, jalapeno and garlic. Set aside. 1 of 2 Heat grill to medium-high heat. Melt butter in a cast-iron skillet set on grill rack. Add onion and salt and cook 10 minutes, stirring frequently. Carefully remove pan from grill. 2 of 2 Place 2 tortillas on grill and spread half of each with some of the onion. Grill 30 seconds. Sprinkle 1/2 cup of the cheese over each tortilla and fold to enclose filling. Grill 1 minute, then flip over and grill 30 more seconds. Repeat with remaining tortillas, onion and cheese. 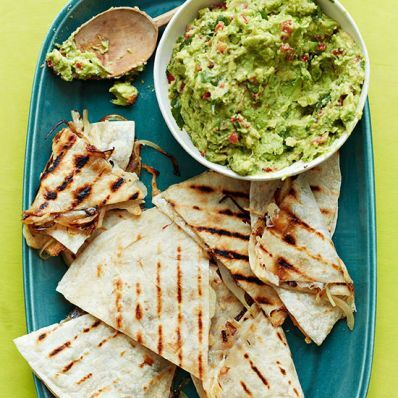 Cut each quesadilla into wedges and serve with guacamole. Per Serving: 631 kcal cal., 40 g Fat, total, 64 mg chol., 15 g sat. fat, 46 g carb., 1045 mg sodium, 15 g fiber, 25 g pro.